CuttingEdge Landscaping Services provides weekly lawn mowing to homes and businesses in and around the Woodbury, MN area. 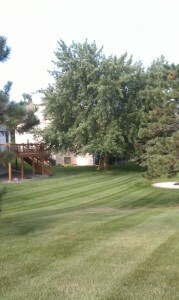 At CuttingEdge, we focus on the small details that turn a lawn mowing service from a good cut, to a CuttingEdge cut! We pay attention to the unique landscape and curvatures of your property. When CuttingEdge pulls up to perfor m weekly outdoor services; you will notice their agility while mowing and trimming around landscapes and trees. Our focus is on quality; and this shows in every property we service as we take a few more moments to ensure nothing was missed. This leaves your lawn looking great! Our weekly lawn mowing service; accompanied with our commercial lawn mowers, will provide the type of lawn care service that you would expect from a commercial lawn care service. Simply put, we work harder for you, and we’ll prove it! So give us a call today, and we’ll be the last lawn care service you’ll ever hire!